Hey! 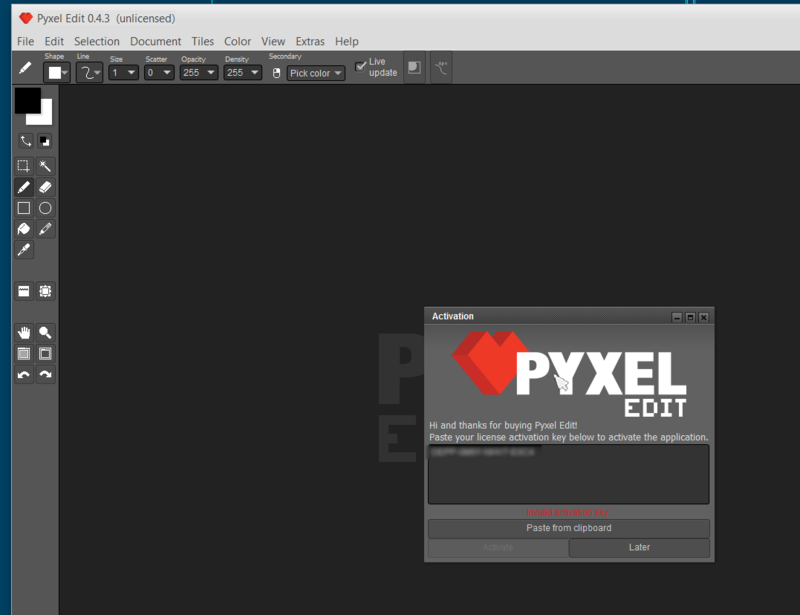 new user here, I'm having issues with activating my copy of Pyxel Edit. I downloaded both Air and portable versions and whenever I try to register it I get an "Invalid activation Key" message when pasting my key (whether I'm including the tags for BEGIN and END or not). That's not good. It seems to be an encoding issue with certain characters. I changed your registered name slightly (removed the ´ , I hope you don't mind) so it should work now. I will fix the bug asap. If anyone else has this issue let me know. Hey, I'm also having the same issue. My name is Rogério Perdiz, so I guess is also due to the accentuation problem. Hi, rogper! I removed the accentuation for you so it should work if you grab the key again. Thank you very much, it works now. Also thanks for making Pyxel Edit I'm really excited to explore it potentials! Hi, I'm having the saaame issue, I just upgraded today and the code is broken. My name is Chibwé Mweene. Could you please help me out? Also , do I have to reinstall it, after the code is fixed? Hi Chibwé, sorry about that! I have changed your name so it should work if you grab a new key. You don't need to reinstall. Thanks so much! It worked. Hello, my name is João Lamego and I am having trouble activating the program, I guess it is related to the fact that my name has a '~' over the 'a', I don't mind if you change it for just 'Joao Lamego' as long as I can use PE fine. Hi João, I have changed your licence name so it should work now. Sorry about that. Hi. I'm having similar issues. My name is Gordon Cranford. Not sure why that won't work, but it's not. Any help would be appreciated. Thanks. I tested your key and it doesn't work in 0.3.100, but it does in the latest version (0.3.101). Let me know if it still doesn't work for you in the latest version. Seems like there still is something glitchy. Which OS are you on? Could you try clicking in the text field and moving the cursor around with the arrow keys? The key is validated on key release, so maybe that event is missed somehow. Okay, that worked. I'm on Windows 8. Thanks for the help. Ok, cool. Then I also know what the problem is. Same problem, just got it today, tried to activate and my code is no good it says. HatTruck, sorry about that. Which OS are you on? Did you try to move the cursor with the arrow keys in the key text box? Also check that you got the whole key without any extra spaces. Using windows 7, I don't think I moved anything. sgdf0, did you follow the activation instructions? Im ok now thank you.